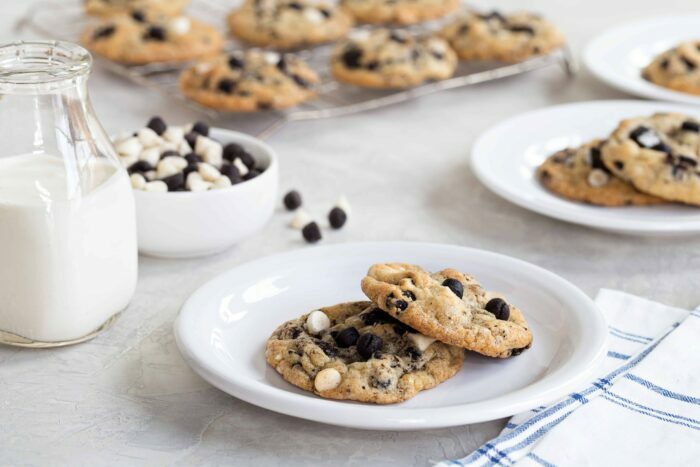 Cookies “N’ Creme Cookies are bursting with big flavor thanks to white chips and chocolate cookie bits. They’re the perfect addition to any holiday dessert table and of course, Santa’s cookie plate! This post is sponsored by The Hershey Company. Thank you for continuing to support the brands that make My Baking Addiction possible. It seriously is the most wonderful time of year! Our home is almost decorated for the holidays – both inside and out. And I’ve started shopping for Elle already, so I’m feeling pretty good over here. One of my absolute favorite things about this time of year is cookies. Personally, I’m pretty much fan of any cookie ya put in front of me, but Eric and Elle are definitely both team chocolate chip cookie. In fact, there’s usually a container of Eric’s favorite homemade cookie dough in the fridge at all times. Can you say spoiled much? I’m just kidding – kind of. He totally empties the dishwasher on demand and cleans up after me 24/7, so it’s basically his reward for putting up with a chronically messy kitchen. One of the reasons that I love baking cookies so much is that they’re pretty simple. So simple that Elle can handle most of the mixing and even some of the measuring on her own. Sure, it can be a little messy and not 100% perfect, but I can see her confidence build with every cracked egg and splash of vanilla. And that, my friends, is worth every second we spend cleaning up flour from the floor. We all know it’s important to eat dinner together as a family, but I personally think it’s just important to get them into the process of making things too. I’ve definitely noticed Elle is more willing to try new things if she helped cook them too. She’s been feeling a little under the weather the last few days (thanks, preschool) so I decided to whip up a batch of Cookies ‘N’ Creme Cookies. And of course, she wanted to help. 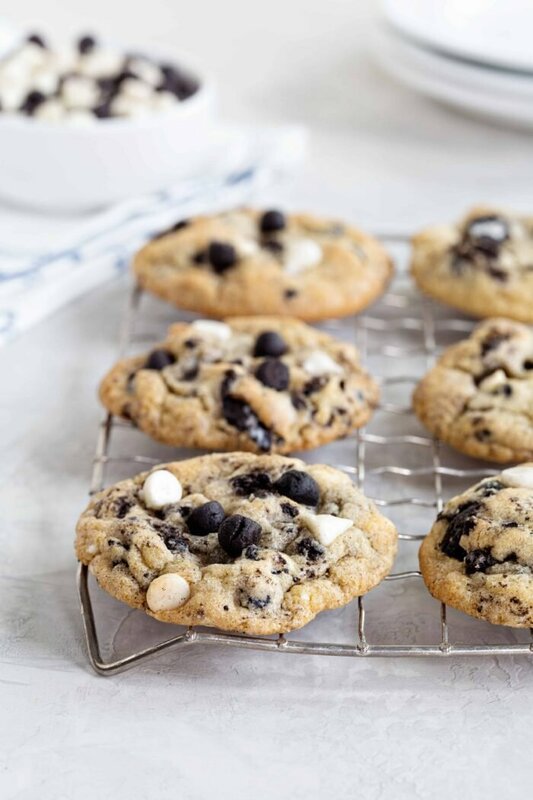 But these Cookies ‘N’ Creme Cookies are definitely not your standard chocolate chip cookies. 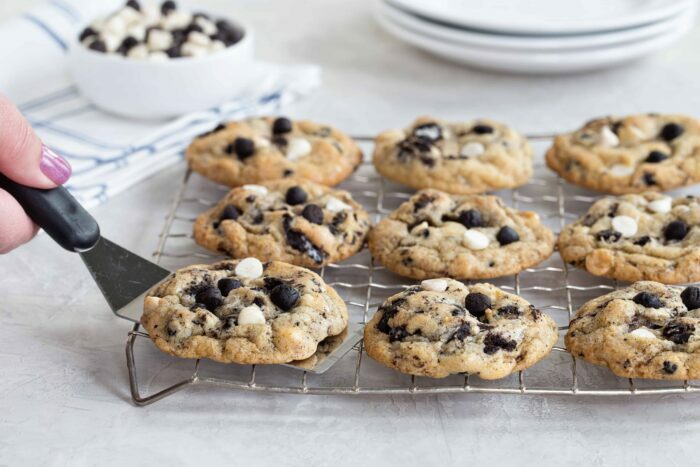 They’re loaded with crushed chocolate sandwich cookies and HERSHEY’S Cookies ‘N’ Creme Baking Pieces. 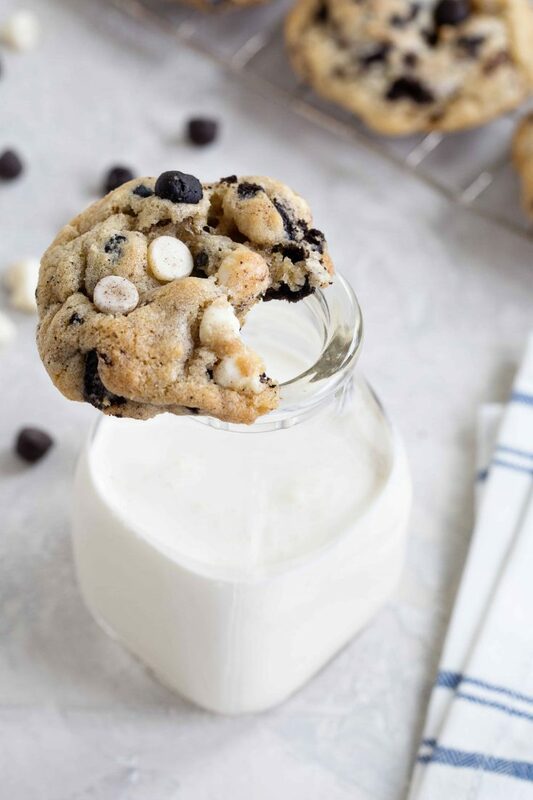 Seriously a match made in cookie heaven. 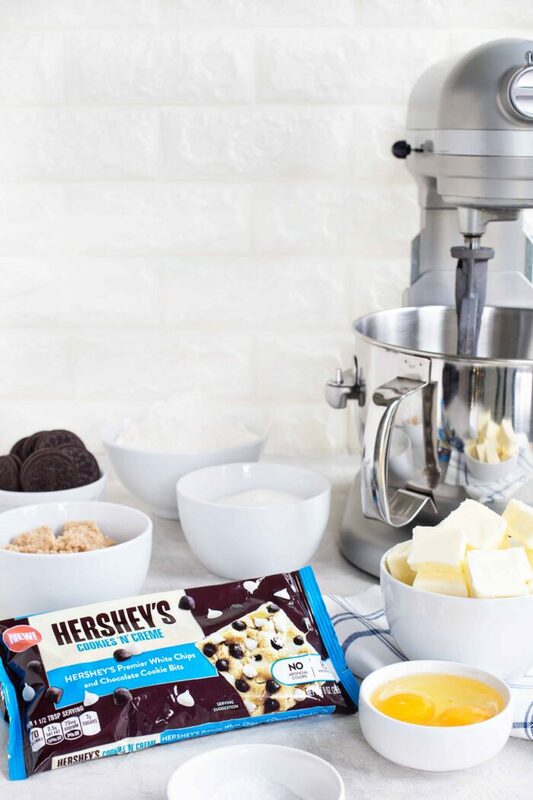 If you haven’t tried HERSHEY’S Cookies ‘N’ Creme Baking Pieces, you seriously need to pick them up along with HERSHEY’S Sea Salt Caramel Baking Chips – they are so darn good! These pieces have been developed specifically for baking, making them excellent in cookies and bars. Elle and I could not get enough of the combination in this recipe. I’ve become slightly obsessed with the Cookies ‘N’ Creme Baking Pieces, if I’m being honest. I want to try them in chocolate-based cookies, and I bet they’d be incredible sprinkled into your favorite brownies. 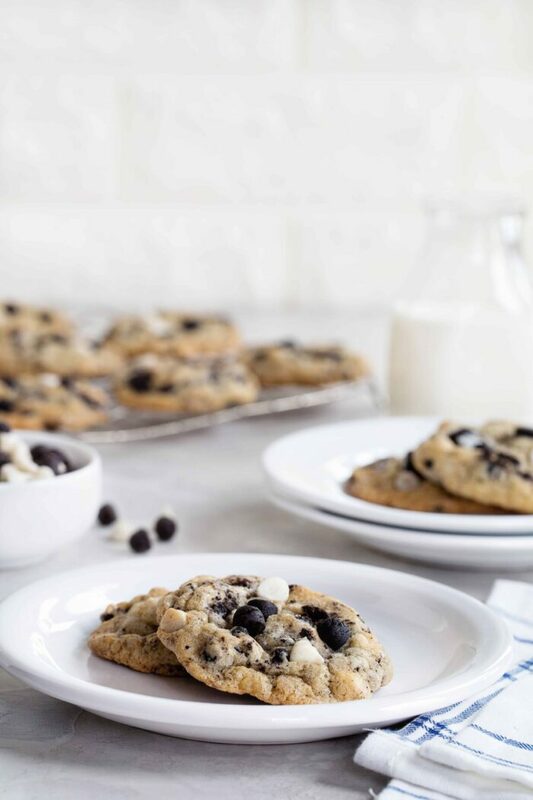 Whether this is your first time baking cookies or your hundredth, make sure you check out my tips for cookie success on the HERSHEY’S Kitchens blog. They could just up your cookie game! In a large bowl with an electric mixer, beat butter and sugars until well-blended and fluffy in texture. Add in eggs and vanilla and mix until combined. Gradually add the flour mixture into the butter mixture and mix until just combined. Stir in the baking pieces and chopped cookie pieces until evenly incorporated. Cover cookie dough and refrigerate for 2 hours. 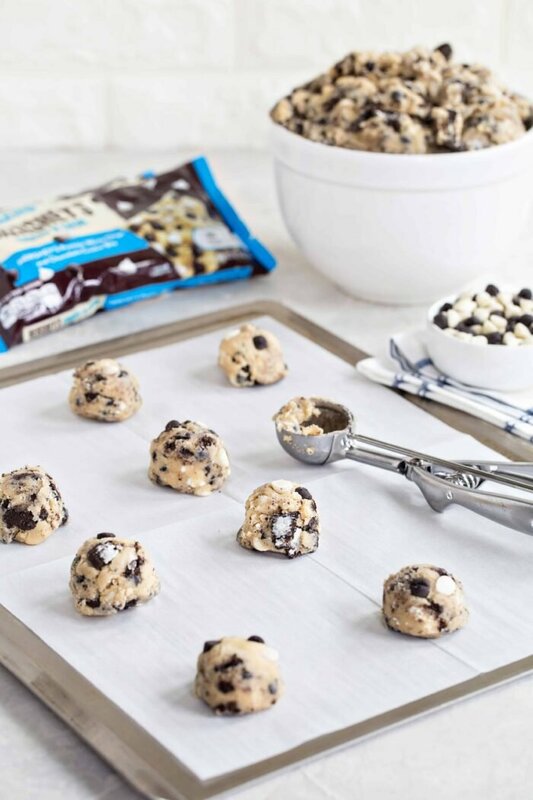 Use a medium cookie scoop (about 1-1/2 tablespoons) to scoop dough onto the prepared cookie sheets. Bake in preheated oven for 10-12 minutes. 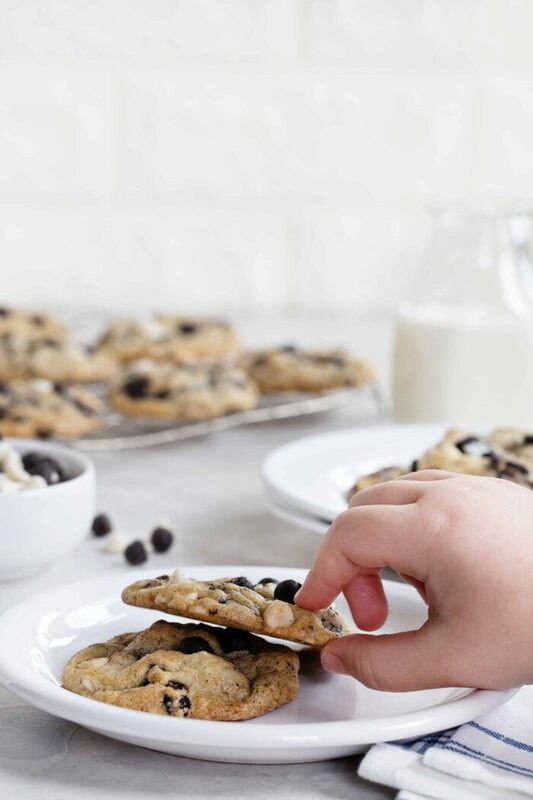 Allow cookies to cook on pan for about 5 minutes before transferring them to a cooling rack to cool completely. Thanks so much, Natalie! I appreciate you stopping by and taking the time to comment. Cookies and Cream is my sons FAVORITE FLAVOR! For my son’s graduation I made cookies and cream cupcakes……….to bad I didn’t have those baking chips. I don’t think they were out in the stores yet? Hello! I have seen them in stores for sure. Try Target, I think that is where I saw them the other day. Happy baking! Looks delicious. I have got to find those cookies and cream chips. I hope you love them as much as we do, Regina! These cookies are delicious! My daughter’s class really enjoyed them. So did my family. 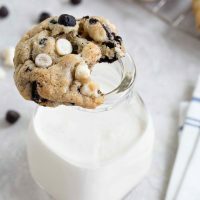 The cookies are the exact flavor of what you expect from cookies and cream. I used cookies and cream candy bars (I chopped them), since I had them on hand. I also froze some dough, already portioned, for later baking. The frozen dough baked beautifully, just like the refrigerated dough. I am looking forward to making these again! Thank you, Jamie, for the recipe! I bake a LOT and I had quite a few people tell me these are their new favorite. So glad I found this recipe. Thanks so much! So happy to hear you enjoyed the cookies, Karen! Thanks so much for stopping by and leaving your feedback!